The One-Line: Several honor students mistakenly believe they’ve accidentally killed their substitute teacher by playing a prank on her. Not yet published. If you'd like to read or produce this play royalty free, send me an email and I will send you a PDF copy. Synopsis: When Alex learns that Miss Ewlenhope, a substitute teacher famous for her sneezing allergies, will be substituting for her Honors English class, she convinces the class to prank the sub. 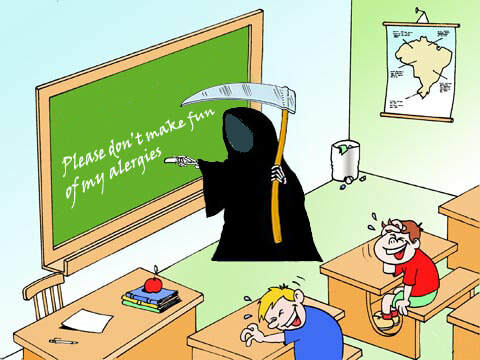 But Miss Ewlenhope, who sneezes whenever she gets flustered, has a new allergy remedy. The only problem with it is that it makes her drowsy. When the honor students prank her, she gets so flustered that she accidentally takes four times her normal dosage. The remedy is so powerful that she falls asleep in mid-sentence and collapses on the floor. The honor students mistakenly believe that their prank has killed the substitute! This leads them on a guilt-ridden path to hide the body in an effort to keep their college scholarships.